In this video, I walk you thru how to fill out the quiz. Please feel to schedule your free 1:1 60 min jam session with me to go over your results. We try to lose 30 pounds, change our hair color, read self-help books, try to appear interesting and beautiful so that others will see our worth and love us. We do all of this because we secretly believe that, if other people, especially our significant others, love us, then all of our issues will magically disappear. What we don’t realize is that we are addressing a branch on the tree that is love. We aren’t getting to the root cause of our issues. We are merely looking at the symptoms. We don’t make the connection between the external circumstances and our internal beliefs. Oftentimes, a lot of the stuff that is happening in our lives can be attributed to not loving ourselves. Long standing patterns can be sure signs that we aren't valuing ourselves or loving ourselves unconditionally. We are usually judging everything and everyone, including ourselves. It's time to start a new chapter in our lives and get to the root of it all: loving ourselves unconditionally and with self-compassion. There is only one of you and it's time to love her with all your heart. Our lack of self-love manifests in many different ways. For me, it manifested as buying new clothes (and going into debt) to make myself desirable, being in relationships that didn’t nourish my soul and working at companies that didn’t really value my contribution. For you, it may be people pleasing, playing small or overeating. Whatever the case may be, our lack of self-love manifests as many red flags in our careers, diets, relationships and thinking. That’s why I’ve created a self-love spectrum quiz so that you can ramp up your self-awareness. 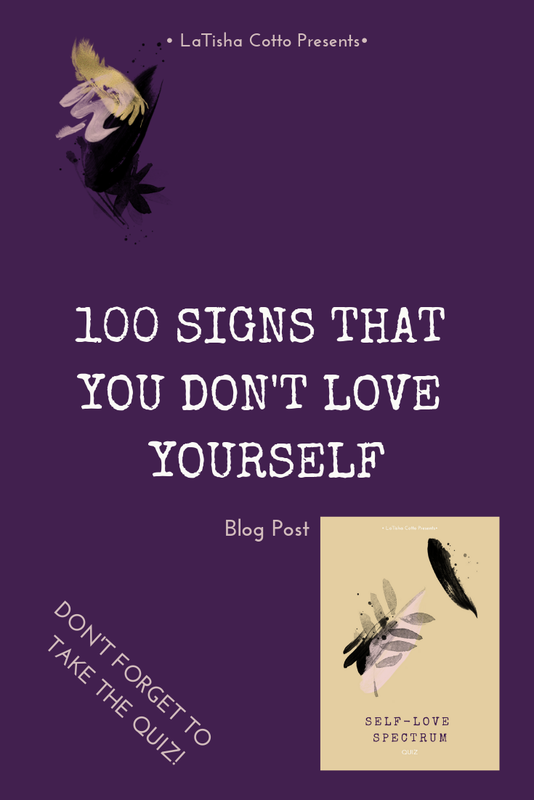 I include 100 signs that indicate a lack of self-love and help you to identify which areas of your life need your loving kindness, attention and healing. I pray that this quiz is helpful to you as you start your year off with a bang. Now it's your turn. Want to see where you fall on the self-love spectrum? Take the quiz and find out right now. I'm cheering for you. Like you're gonna make a change for once in your life. P/S Not sure what to do after you receive your results? Schedule your initial 1:1 60 min jam session with me. It's on the house. Make a copy of the file before you begin. For each of the 100 items listed, give yourself 10 points in Column C for the ones that are true for you. Your total score will automatically calculate at the bottom. Mark a lowercase "x" underneath the color of the item. Your total score will automatically calculate at the bottom. Notice if you scored higher in a particular color and read below for explanation.